Arianna – Blond Gene doll all done. A new doll-art on eBay this week. New Banner/Logo for my eBay auction. 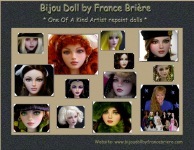 OOAK Bijou Doll by France Briere fashion doll Calendars 2015.